Midwife poster created by British wartime artist during WWI. Imperial War Museum. The rise and fall of midwifery as an accepted profession is directly linked to the medicalization of birth, feminism, and social conditions. The history of midwifery in Canada is similar to the rise and fall of midwifery in the United States and Europe. For years women gave birth at home surrounded by female relatives and neighbours, with the birth being presided over by a female midwife. The establishment of the medical profession, rise of science in health care, and lack of professional midwife organizations all contributed to the marginalization of midwifery by the mid 1900s. Birth became a medical intervention that took place in a depersonalized hospital room directed by a physician. The medicalization of birth coincided with the decline in usage of midwives. In many provinces midwifery became ‘alegal;’ midwifery services weren’t illegal but they weren’t regulated or accepted as part of the provincial health care system. In Canada this meant that midwife services were not covered under provincial health insurance and women looking to use a midwife had to pay out of pocket. Beginning in the 1960s and peaking in the 1980s there was a resurgence of interest in natural births. Women began to question the medicalization of their birthing experiences. During this period the home birth movement gained popularity and midwifery began to see social acceptance on a larger scale. In 1991 Ontario was the first province to regulate ( Regulated Health Professions Act, 1991;Midwifery Act, 1991, S.O. 1991, c. 31;General, O. Reg. 240/94;Registration, O. Reg. 168/11;Designated Drugs, O. Reg. 884/93; andProfessional Misconduct, O. Reg. 388/09) midwifery. British Columbia, Alberta, and other provinces also began to regulate midwifery in the 1990s. However, there are still provinces in which midwifery has not been regulated or brought under the provincial health care model. Midwifery is currently not regulated in Prince Edward Island or the Yukon. New Brunswick passed a Midwifery Act in 2012 however no midwives were registered to practice by 2013 and the licensing body was eliminated. In Newfoundland and Labrador midwives fall under the Health Professions Act, however there are no licensed or practicing midwives in the province. The Newfoundland provincial government announced that they want to bring back and formally regulate midwives, however progress has been slow. Additional details about the current legal status of midwifery in each province and territory in Canada can be found here. In the Netherlands over 80 percent of births are attended by a midwife. Similarly, in the UK midwives are responsible for the majority of births. In contrast less than 5 percent of births in Canada are attended by midwives. Part of the cause for this is that Canada was one of the last industrialized nation to regulate midwifery care. Midwifery has expanded in the past 20 years but the growth has been slow and uneven across the country. In Ontario, 47% of midwives are in the first five years of practice. The high number of new professionals speaks to the growth and demand for midwifery in the province. In 2014 Ontario also saw the development of the Toronto Birth Centre and the Ottawa Birth and Wellness Centre run entirely by midwives. These birth centres provide additional options for women seeking alternatives to hospital births. The legal status of midwifery in Canada has a fraught past which varies greatly across the country. Today midwifery services in Canada still vary greatly depending on where you live. This is despite studies that have shown midwifery care is cost effective, safe for the large majority of low risk births, and is growing in demand. Many provinces are still grappling with integrating midwifery into the provincial health care system and women’s birthing options are limited by where they live. Women who live in remote or rural areas often have to leave their communities to access maternity care and have very few birthing choices available to them. The provincially regulated nature of Canada’s health care system makes it unavoidable that care options will vary across the country. But as demands for midwifery care grow nationally provincial governments, the medical field, and communities need to consider viable options for sustaining midwifery practices. Krista McCracken is a Researcher/Curator at Algoma University’s Shingwauk Residential Schools Centre. She is a co-editor at Activehistory.ca. 1. Plummer, Kate. 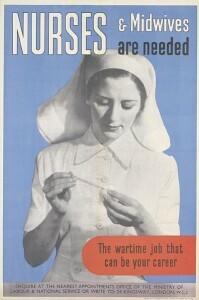 “From Nursing Outposts to Contemporary Midwifery in 20th Century Canada.” Journal of Midwifery & Women’s Health (2000), 45: 169-175. Shannon, thank you for sharing the “A midwife at every confinement” article. It provides an excellent contrast between the two regions and highlights the drastic differences in birth experiences between the two countries.